Gigabit Switching Hub There are 4 products. Think Green The D-Link 5-Port Gigabit Switch is part of D-Links new series of SOHO devices that make use of D-Links Green Technology, providing energy savings, reduced heat, and a longer product life without sacrificing performance or functionality. Think Green The D-Link 8-port Gigabit Switch is part of D-Links new series of SOHO devices that make use of D-Links Green Technology, providing energy savings, reduced heat, and a longer product life without sacrificing performance or functionality. 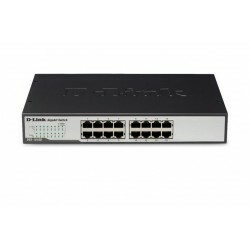 D-Link GigaExpress DGS-1016D is a 16-port 10/100/1000Mbps Gigabit Switch that delivers power, performance, and reliability in one cost-effective, space-saving design. It is able to increase the speed of your network server and backbone connections, or provide Gigabit to your desktop. D-Link GigaExpress DGS-1024D is a 24-port 10/100/1000Mbps Gigabit Switch that delivers power, performance, and reliability in one cost-effective, space-saving design. 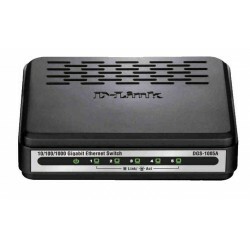 It is able to increase the speed of your network server and backbone connections, or provide Gigabit to your desktop.